After the most pious bishop Theodoret was seated in their midst, the most pious Eastern bishops and those [allied] with them cried out: "He is worthy!" The most pious Egyptian bishops and those [allied] with them, shouted: "Do not call him a bishop! He is not a bishop! He is not a bishop! Cast out the attacker of God! Cast out the Jew! ... Cast out the one who insulted Christ! ... He anathematized Cyril!" The most pious Eastern bishops ... clamored: "Cast out the murderer, Disocorus!" The most pious Egyptian bishops ... shouted: "[Theodoret] has no right to speak! He was deposed by the whole synod!" Basil, the most pious bishop of Traianopolis, said: "Even we deposed Theodoret." The most pious Egyptian bishops ... cried out: "And Theodoret denounced Cyril! We throw away Cyril, if we accept Theodoret! The canons cast him out! God [Himself] turned away from this man!" Shouts continued until halted by the imperial officials, who chided the bishops for their "vulgar clamorings." Still, this verbal abuse actually marked an improvement. Two decades earlier, a council had descended into street riots. Two years earlier, a synod had culminated in a near-murderous manhandling. This time, at Chalcedon, the lay officials intervened to forestall violence. They pushed the bishops to forge consensus on every major issue. By 451, however, the bishops had been feuding for twenty years. Hostility among clerics, monks, and laypeople proved possible to redirect but hard to resolve. These scenes of clerical confrontation have fascinated scholars, and not just because bishops were behaving badly. The exchange over Theodoret at Chalcedon showcases an obvious feature of late Roman religious life: stark divisions over doctrine. On the right side of the church in Chalcedon sat a group of clerics mainly from Egypt, associated with Cyril and Dioscorus. On the left side sat a clique mainly from "Syria" (a.k.a. "the East"), associated with Theodoret. These groups are traditionally defined by their answers to one theological question: how many "natures" (Greek: physeis) existed in Christ. Dioscorus's party preferred to speak of "one nature (incarnate)" and are usually called miaphysites (or monophysites). Theodoret's party chose to speak of "two natures" and are labeled dyophysites (or "Antiochenes"). This doctrinal difference became the prime marker of intraclerical hostilities. But doctrinal partisanship was not the only factor in clerical relations. Friendship and mentorship linked bishop to bishop. Patronage ties bound bishops to people across late Roman society. Doctrinal alliances nurtured a sense of community that extended beyond the clergy. By 451, clerics were under pressure to curb their partisanship. By then, however, they had ignited a controversy that would eventually produce three separate Christian communities. This book seeks to comprehend the Christological dispute by investigating the social dynamics that fostered alliance and conflict. It focuses on the dyophysites, a.k.a. the "Antiochenes," who assembled around Theodoret of Cyrrhus. Theodoret is best known as a hagiographer, a church historian, a Christian apologist, and a theologian. Yet he was also a social actor. He sought influence over a clerical coalition and across late Roman society. Here we shall investigate both Theodoret's doctrines and his social relations, as each influenced the other in turn. To study Theodoret's social world, this book examines underutilized sources and takes a network approach to social history. Theodoret and his associates appear in varied sources, but their social relations are primarily illuminated by conciliar records and collected letters. These two archives showcase Theodoret's coalition in the act of communicating. They enable a rereading of Theodoret's other writings in richer context. To deal with all these sources requires an approach that integrates doctrinal, social, and cultural analysis. This study seeks such an approach through network theory. Theodoret's coalition can be seen as a socio-doctrinal network, a shifting cluster of mostly clerics bound by friendship and theological agreement. Theodoret's broader social relations can be seen as a patronage network, which included many doctrinal allies and linked them to clients, protectors, and friends. Each of these networks fostered certain attitudes and cultural practices. Together, I argue, they created a resonance between theology and social interaction, which encouraged religious certainty and conflict. Before examining sources and arguments, however, let us survey the Christological dispute and the larger historical context. As we shall see, this clash has left unanswered questions that call for a fresh look. The late Roman world had more than its share of religious conflict. Such, at least, is the impression one gets from our sources. During the fourth and fifth centuries, Christian leaders assembled arguments against Jews and pagans. They also made accusations of heresy as they discovered internal splits. The Christological dispute began with the words of a few clerics, but it drew more imperial involvement and sparked more riots than nearly any cultural struggle of the time. Generations of scholars have studied this dispute, which permanently fractured the Christian community. They have lacked neither sources nor knowledge of the historical context. Nevertheless the dispute remains puzzling for its intensity and its duration. The Christological dispute began, like many religious conflicts, with the discovery of differences among allies. In the late fourth century Christian clerics were still arguing over the status of Christ as the Son of God. Texts of the New Testament offered them conflicting signals, noting Christ's godlike powers in one passage and His human-like weakness in the next. A range of people sought to make sense of this matter. The active disputants assembled into loose parties, by signing ambiguous formulas and by labeling their foes. The Nicenes constituted one such amorphous coalition. Its members agreed that the divine Trinity was fully perfect and transcendent-that Christ the Son, despite his human attributes, was "of the same substance" as the Father. But this Nicene agreement masked a split between two groups with different ways of arguing their case. One set of Nicene clerics (centered in Antioch) sought explanations to dispel Scriptural paradox. They explained that Christ had a full humanity distinguishable from his Godhead. Thus when Christians read about Christ enduring suffering, they could ascribe it to his human component without impinging on the perfect God. Lists of Christ's human and divine attributes marked this approach. So did the formula "Two natures (dyo physeis) in Christ," which, in the early fifth century, Theodore of Mopsuestia expressed most directly. A second set of Nicene clerics sought overt ways to express Scriptural paradox. This group emphasized that Christ was simply God the Word (a singular subject), who had decided to humble Himself by taking on human weakness. Thus, when Christians heard about Christ enduring suffering, they could see it as the mysterious act of an all-powerful Deity. Statements of "God suffering in the flesh" marked this approach; so did the formula "one nature (mia physis) incarnate of the Word of God," which Cyril of Alexandria stated most prominently. These two clerical groups taught for a generation without controversy, but starting in the late 420s they came into conflict. In 428, (the dyophysite) Nestorius was chosen as bishop of Constantinople. Famously he suggested that Christians should not call Mary the "One who bore God," (Theotokos), but more precisely the "One who bore Christ" (Christotokos). This statement sparked local hostilities. And it offended Cyril, for it seemed to divide Jesus from the divine. Cyril denounced Nestorius and demanded he foreswear twelve specific doctrines. This demand offended Nestorius's allies; for it seemed to deny the impassibility of God. In 431, Emperor Theodosius II called a council in Ephesus to settle the dispute. Cyril convened the summer meeting before Nestorius's supporters arrived. The two sides formed separate assemblies, and, amid street riots, each excommunicated the other. A colloquy that fall in Chalcedon failed to reach an accord. Regional schism now divided the Nicene church, and soon this split involved not just clerics, but protesting crowds of monks and lay partisans. During the 430s the imperial court pushed the Eastern dyophysites to rejoin communion with Cyril and his associates. It sent mediators to run negotiations. It sought defectors and threatened holdouts with exile. In 433, negotiators reached a settlement, a Formula of Reunion that excluded neither "one nature incarnate" nor "two natures in Christ." The agreement did accept the condemnation of Nestorius. Nearly half of the Eastern bishops initially refused to sign, though by 435 most were convinced to do so. The Formula of Reunion, however, furnished only a truce. Dyophysites faced criticism from Cyril until his death in 444, and they remained suspect at court. And now, the church in Syria was divided; clerics, monks, and lay partisans waited to clash again. Then the doctrinal truce broke down. In 447 Theodoret wrote in defense of "two natures." He criticized certain monks (perhaps Eutyches of Constantinople) for denying Christ's humanity. In response some associates of the late Cyril accused Theodoret and his allies of heresy, among other crimes. Theodoret and his partisans still pressed their claims. Eutyches was tried for heresy before Flavian of Constantinople. But by 449, Theodosius II was fed up with the Eastern dyophysites. A Second Council of Ephesus convened in August under Dioscorus. After rehabilitating Eutyches, it condemned the dyophysite leaders, who were forced into exile. Yet Dioscorus's victory was short-lived. After Theodosius II died suddenly in July 450, the new emperor Marcian shifted course. Theodoret and some allies were restored before a third big council. The Council of Chalcedon in the fall of 451 aimed at a final settlement. The council praised the late Cyril as a paragon of orthodoxy, even as it offered a generally dyophysite formula ("one hypostasis of Christ made known in two natures"). These decisions were ratified by all but a few attendees. But many clerics and monks protested; several cities responded with large riots. Ultimately the council of Chalcedon magnified the conflict, leaving three factions in place of two, and eventually three self-identified churches across the Middle East. This Christological conflict has been studied thoroughly, but it remains puzzling. Why should a difference in theological language have caused so much bitterness? Why did the clerics of Syria become divided among the theological camps? Why did some monks and laypeople get so involved in this clerical conflict? And what turned small theological parties into large, self-conscious communities? It is hard to address these questions by merely comparing doctrines. To make sense of the Christological dispute, we must start by placing it in its wider context. Bishops like Theodoret argued from a specific social setting in the fifth-century, Eastern Roman world. Famously, church conflicts were tied to imperial politics, which largely (though not entirely) picked the winners. Equally, these conflicts were tied to the social order and the place of bishops therein. But the late Roman world was regionally heterogeneous. Theodoret's dyophysites were based primarily in Syria (which, in this study, means the eleven eastern Roman provinces between the Taurus mountains and the Sea of Galilee, whose clerics later answered to the patriarch of Antioch). In some ways, Syria was typical late Roman territory. But its landscape and varied past fostered local peculiarities, which influenced the course of religious conflict. At first glance, the region of Syria looks like a microcosm of late Roman society. It includes mostly familiar Roman landscapes: fertile coastal plains, well-watered valleys, steep mountains, arable hills, semi-arable steppelands, and deserts. It supported the usual range of Roman settlements, from Antioch (population circa 200,000), to more than one hundred smaller poleis, and thousands of villages. But not every region followed the same demographic trajectory. Unlike western areas, Syria saw its population expand in the fourth and fifth centuries, especially in marginal lands. Syria featured the usual late Roman social hierarchy. Landed wealth and privilege were concentrated in a small local notable class and a smaller senatorial order. But not all settlements were dominated by these elites. Much of Syria hosted pastoralists and peasant proprietors, as well as tenant farmers and slaves. In most respects, Syria featured the standard trappings of a coherent Eastern Roman government. Residents answered to municipal councilors and short-term governors (and their officers). The whole region answered to emperors and courtiers in Constantinople, aided by thousands of bureaucrats. Again, however, geography mattered. Bordering Sassanid Persia, Syria supported a massive Roman army. It thus drew unusual levels of imperial attention, both military and legal. But unlike other frontier zones, Syria faced few fifth-century wars. Other Roman regions endured crises; in Syria, the political and social order held firm. Despite its typical political and social hierarchies, late Roman Syria was made distinctive by its diverse culture. Some variety came from past waves of migration, which brought the region its five major languages. Some came from a complicated political heritage. In western Syria centuries of Hellenistic and Roman rule had a palpable impact on laws, architecture, and literary education. In eastern Syria, local rule into the third century encouraged Syriac (and eventually Armenian) written culture alongside Greek. Syrian society was not fractured by its diversity. But each district had its own mix of customs and influences. Perhaps the surest mark of Syrian diversity was religion. Like many Roman regions, Syria boasted a wide range of traditional local cults. It also hosted translocal religious communities, Magian, Manichaean, theurgic-pagan and Jewish. By 450, the majority of Syrians probably practiced some form of Christianity, but they still differed in cultic habits. Urban congregations lived under clerical oversight while many villages rarely saw priests. Most Christian families lived much like their non-Christian forebears, a lifestyle rejected by the growing monastic movement. Christian culture varied with the local language. It also varied with the preferred theology. In much of Syria, the Nicene clergy was a recent presence, not necessarily welcome. It is in this context that we must place the main participants in the Christological dispute: Theodoret and his fellow bishops. For bishops in Syria played a key social and cultural role. Some bishops were wealthy landowners; others were honored ascetics. Some rose through the local clergy, while others were recruited externally. Whatever their background, the bishops took on important tasks for their communities. They arbitrated disputes, redistributed alms, hired subordinates, and cared for widows and orphans. They organized festivals, ran building projects, supported civic councils, and oversaw monasteries. Bishops still needed cooperation from other clerics and other sorts of notables. But they were well placed to voice their concerns. The life of Theodoret, in fact, exemplifies the complicated position of late Roman bishops. Born in 393 in Antioch, he was educated in Christian and sophistic (classical) traditions. As a monk (ca. 415-423), Theodoret studied Christian doctrine, but also non-Christian philosophy. As bishop (423-460s) he presided over a small town near Antioch with a populous rural territory. He constantly courted its notables and toured its villages. At the same time, he befriended pagan teachers and Christian hermits, wealthy courtiers and tenant farmers, speakers of Greek and speakers of Aramaic. Theodoret was atypical, for his learning and connections. But his performance as bishop had to fit the social context to give him hope of influence. These features of late Roman Syria are familiar to historians, but they remain essential to understanding the conflict. Partisans in the Christological dispute were more than just doctrinal mouthpieces; they were participants in diverse regional communities. Everything they said or did had both theological and social implications. Usually, in premodern history, the links between doctrine and social life are obscure. For the Christological dispute, however, a closer look is possible. The clashes over Christology make for an unusual scholarly opportunity. No other episode in late Roman history is so richly documented. Like other religious disputes this conflict produced contrasting works of theology. Like other clashes it inspired hagiographic works and church histories. The Christological dispute, however, offers two caches of uncommon documents- transcripts from church councils, and collections of letters. These two archives present special interpretive problems, but they remain unequaled as records of ancient social interaction and religious controversy. The largest cache of sources for the Christological dispute comes from church councils. These synods kept stenographic records. Their acta featured statements by delegates and witnesses and acclamations by attendees. The gatherings also assembled supporting documents-excerpts from treatises, sermons, and letters. The First Council of Ephesus (431) produced two collections, one geared to support each party. The Second Council of Ephesus (449) also produced two transcripts, each covering about half of the meeting. Records from the Council of Chalcedon (451) were both more unified and more extensive, with transcripts of (nearly) every session and long excerpts from the acta of the prior synods. The second archive of sources for the dispute comprises collections of letters. Like most late Roman notables, the bishops conducted correspondence. They wrote to monks about lifestyle choices and to congregants about family issues. They wrote to wealthy notables about donations and to officials about taxes. Most often, the bishops wrote to one another, on everything from friendship to doctrine. About six hundred letters survive from the main participants in this controversy, grouped into various collections. More than half were kept as evidence in the conciliar records. Some of these were saved by miaphysite supporters of Cyril, some by proponents of the Council of Chalcedon. The most important conciliar collection, for our purposes, was assembled by one man: the dyophsysite exile Irenaeus of Tyre (in his Tragedy). The rest of the letters come from personal collections. The largest personal set belongs to Theodoret, with nearly two hundred entries in two surviving manuscript traditions. A smaller set comes from the miaphysite Firmus of Caesarea in Cappadocia, from one manuscript with forty-six letters. These two source archives have limitations. The acta and correspondence were first gathered by active disputants; often they show partisan agendas. For some sessions we have multiple contrasting records; for others, only one version. Official Chalcedonian records were kept in Greek, but some transcripts survive only in translation-miaphysite records in Syriac, Irenaeus's Tragedy in Latin. All of the conciliar records may have received later editing. Personal letters, meanwhile, were assembled as examples of rhetoric or clerical conduct. These letters survive mostly in Greek (some conciliar letters, again, exist only in translation). Occasionally extant letters preserve both sides of a conversation. Often only one side remains. Some letters hint at a date of composition, but they are not evenly distributed in time. Theodoret's dateable notes, for instance, were mostly penned between 430 and 435 or between 443 and 450; just a few were written in the 420s and only one after 451. In any case, nearly a third of his letters can only be dated within ten years. Like the conciliar documents, the letters may have been edited. Assuredly they were selected and removed from their original context. There are, of course, other types of sources related to this dispute. Doctrinal treatises abound, especially from Cyril and Theodoret. These writings add arguments to basic theological formulas. Biblical commentaries also abound, including a set by Theodoret. These works reveal how much doctrinal partisanship intertwined with the reading of Scripture. Several authors wrote Church Histories during the conflict, including Theodoret. Such narratives provide both information about the disputes and competing visions of Christian community. Several participants wrote hagiographies, from the anonymous Life of Rabbula to the History of the Friends of God by Theodoret. These works showcase the interplay between doctrinal alliance and ascetic affiliation. Few artifacts, inscriptions, or papyri can be tied directly to this controversy. But the rich archaeology of certain portions of Syria helps to illuminate the social context. Yet it is the letters and council acts that enable unusual scholarship. No ancient gathering is so well documented as the church councils. No ancient conversation is so fully recorded. Comparable letter collections come from other late Romans, including the bishop Basil of Caesarea, the sophist Libanius of Antioch, and the philosopher-bishop Synesius of Cyrene. But these letters and acta constitute a unique body of evidence. They feature two decades of socially embedded messages. They attest to hundreds of relationships, which form a context for reading other sources. No text will solve all puzzles of late Roman religious conflict, but together these texts surely help. The Christological dispute thus presents enduring questions and fortuitous sources. But how should we use the sources to explore the social dynamics of religious conflict? Many scholars have studied the dispute and its participants. Until recently, most dealt either with doctrine or, separately, with social relations. The questions posed here, however, call for an integrative approach, which incorporates doctrine into social and cultural analysis. To craft such an approach, this study draws on recent trends in sociology, especially social network theory. Network theory features methods for analyzing personal interactions. It offers a framework for combining social concepts (such as patronage) with cultural concepts (such as performance). Network theory is no panacea but seems well suited to the sources and questions at hand. The Christological dispute has received plenty of scholarly attention. The majority of studies have come from historical theologians. They have scrutinized the teachings of leading partisans. They have chronicled the development of doctrines from various influences. Meanwhile, broader studies have come from social historians. These works have examined church-state politics and the shaping of religious institutions. They have looked at ecclesiastical resources, the social background of clerics, relations between clerics and monks, and the position of bishops in Roman communities. Recent work has mostly taken the form of cultural studies. These efforts have explored the representation of bishops and ascetics within the sources. They have tied such depictions to the construction of religious authority and Christian identity. Studies of Theodoret's vast corpus have also abounded. But they have likewise usually considered doctrine separately from culture and social relations. This book is indebted to generations of scholars who have examined the Christological dispute. The topic, however, could benefit from fresh approaches. Fifty years ago, historians and historical theologians tended to operate with contrasting assumptions. Most theologians assumed that clerics pursued theological truth. Most historians assumed that clerics pursued social authority. Recently scholars have crossed disciplines more readily. Few, however, have dealt with this episode's full social complexity. Perhaps this is due to intimidating sources; perhaps, to those contrasting assumptions. This project seeks an integrative approach, which treats theology as a key factor in social relations. But how should we envision the social aspect of religion? Many theorists have made suggestions. Cultural anthropologists once defined religion as a "symbolic system" that both follows and affects social reality. Post-structuralists cast religion as discourse, which constructs social boundaries and figures of authority. Cognitivists treat religion as a mental phenomenon, produced by the same neural systems that manage social interaction. In each case, the theorists have suggested a dynamic link between religion and social processes. Recent studies suggest three specific ways in which religion, as a form of culture, interacts with social relations: through narration, through metaphorical reasoning, and through personal performance. First, many scholars cite the role that narratives play in building communities. According to Francesca Polletta, social movements tend to succeed when they offer communal stories in which members find their place. Second, cognitive linguists stress the importance of deep metaphors (or "frames") in ideological affiliation. According to George Lakoff, ideological parties tend to succeed when they employ shared metaphors tied to basic social icons (such as family roles). Finally, many sociologists now define social relations as the performance of cultural practices. Pierre Bourdieu linked social positioning to the learning of behavioral cues (habitus). Jeffrey Alexander notes how flexibly people display such cues, in order to link up with various communities. All of these concepts are useful for the study of religious conflict. The letters and acta employ recurring stories and metaphors and can be seen as records of personal performance. But these concepts are insufficient unless they make sense of the relational interactions attested as central to this conflict. One way to deal with such personal interactions is to use social network theory. Network theory pictures society as a web of relationships, which can be categorized, mapped, and modeled. Networks of relationships are assumed to be malleable. But even temporary social bonds transmit culture. In fact, these links only exist if participants communicate their attachment by trading cultural cues. In theory, the notion of a network fits any type of community, including religious movements. In practice, scholars must set limits. Typically scholars concentrate on one category of relationship. They may focus on one central individual or a small core group. This book uses another selection method. If individuals connect by performing certain words and gestures, than a meaningful network can be identified by tracing exchanges of a shared set of these cues. Network theory is built around a series of basic techniques for analyzing social data. One can map any network, with social "links" drawn between human "nodes." One can also measure quantities, such as the "density" of links, or the "centrality" of nodes. One can look for relational patterns, such as central vs. peripheral locations, internal clusters, and "hubs." One can even map different types of relationship as overlapping networks. Thus one can distinguish simple from "multiplex" bonds and find "mediators" between disparate groups. In addition to analytical methods, network theory provides a helpful perspective on key concepts, such as leadership, friendship, and patronage. Network scholars treat these concepts as relational patterns, bound to culturally defined roles. Anthropologist Jeremy Boissevain defines patronage as "personal, asymmetrical, non-monetary, reciprocal" relationships. These links are, in his view, marked by the exchange of material favors for signs of loyalty. Boissevain distinguishes patronage from friendship, which aspires to emotional symmetry. He treats roles of patronage and friendship as situational. Patrons, clients, mediators, and companions are identified by their participation in a transactional network. Boissevain also frames leadership as situational, based on relational positioning as well as official titles. Central figures can claim informal leadership, in his view, by asserting influence over contacts within the network. This book draws on Boissevain's definitions, while retaining the significance of culture. The roles of patron, friend, and leader are situational, but to assume even temporary positions people must flesh out their roles by performing cultural cues. Network theory started in the 1960s with measurements and definitions. In recent years it has expanded into a "science," which theorizes about relational systems through observation and computer modeling. Scholars, such as Albert-László Barabási and Duncan Watts, have uncovered consistent patterns in the development of "self-organizing" networks. One general pattern, they note, tends to arise when a group steadily adds new members: the modular scale-free topology. Modular scale-free networks feature cliques linked together by a handful of "hubs." They vary significantly, depending on the number of hubs and the way these hubs relate to one another (see figure 1). Simulated modular scale-free networks usually survive the random loss of members. They can, however, be reshaped if hubs change, and dismantled if a majority of hubs are removed. This study uses Barabási's and Watt's models to interpret social outcomes that are already evident in the sources. As we shall see, some ancient networks look "modular" and "scale-free" and behaved accordingly. Like any abstract construct, network theory has limitations in historical research. Some of these limitations are conceptually inherent. Social bonds are not objective facts, but the sum of temporary perceptions. They can only be traced when communicated intersubjectively. Networks, too, are not objective facts, but representations. People draw mental networks to represent their social relations. These mental networks, however, vary from person to person. They may include imagined social actors (such as God, dead saints, or demons). None of them can be expected to match the networks mapped out by scholars. Network maps always simplify social experience. They cannot capture all the differentials of authority, which shift with the cultural context. Further limitations of network theory have to do with the extant sources. Letters and acta supply patchy relational data. Inevitably they produce a social map that is incomplete and chronologically imprecise. Used incautiously, a network map might overemphasize certain relationships and miss others entirely. In order to do network analysis, this book deals in approximation. It distinguishes the intersubjective networks of ancient people from their perceptual/mental networks, and both from the network maps of modern observers. It draws on network models for hypotheses, which must be confirmed in other ways. Despite its limitations, network theory provides a practical framework for social and cultural history. Any society can be seen as a web of overlapping networks, which can be measured, modeled, and compared. Sources, such as letters and transcripts, give evidence for relationships. As modern observers, we will never discern every ancient social connection. But we can find meaningful networks by charting the exchange of socially resonant cues. Network maps can be drawn synchronically, to create a richer picture. They can also be studied over time, and compared to existing models. Network analysis might seem theoretically insular. In fact, it compliments cultural studies. Networks give context to people's performances, shape the models by which people reason metaphorically, and provide a basis for storytelling that builds community. To study late Roman religious conflict, a network approach to social history is well suited. It makes the most of underutilized sources, and it allows persistent questions to be addressed. This study is hardly the first to do network history in a premodern context. Elizabeth Clark mapped the elite networks that contended in the Origenist controversy. Catherine Hezser employed network concepts to describe the early Rabbinic movement. Margaret Mullett used letters to map the social contacts of twelfth-century Bishop Theophylact of Ohrid. Each of these scholars combined network analysis with some form of cultural history. More recently Giovanni Ruffini quantitatively analyzed networks evident in late Roman papyri. My approach integrates recent theoretical developments, in network science and other fields. Mainly it differs from prior efforts in how it manages the rich sources to draw out a small social world. The eight chapters of this book explore various aspects of Theodoret's associations. They are divided into two parts. Part I (chapters 1 to 5) looks at how Theodoret related to fellow clerics and other active disputants. Its main subject is the "Antiochene" doctrinal network. Part II (chapters 6 to 8) looks at Theodoret's patronage relations across late Roman society. Its subject is an amorphous transactional system, which overlapped the core of the Antiochene network. The first chapter launches a synchronic investigation of interactions between Theodoret and his doctrinal allies. It surveys the ways in which clerics signaled social attachments through words and nonverbal practices. Extant letters and acta feature a consistent set of social cues, shared by Theodoret and his mostly clerical associates. It is this set of cues that allows us to identify an "Antiochene" network. Chapter 2 continues the synchronic study of "Antiochene" interactions. Tracing the exchange of a characteristic set of cues, it maps and then analyzes Theodoret's doctrinal network. Our maps reveal the demographics of the network, as well as a basic form-modular and scale-free. Mere statistics and comparisons cannot tell us how this network developed. But they do suggest ways to interpret the patterns we see in a diachronic reading of the sources. Chapter 3 begins that diachronic investigation. It explores the origins of the Antiochene network by analyzing the heritage that Theodoret depicted in works of history. Theodoret's writings celebrate his Nicene clerical forebears, including Diodore of Tarsus and Theodore of Mopsuestia. He narrates how these partisans recruited supporters and took over the churches of Syria. Theodoret's narrative must be placed in historiographical context. His depictions, however, make sense of developments in Antiochene doctrine and in Syrian clerical-ascetic relations. Here they receive consideration as an idealized description of a real network. Chapter 4 addresses the social roots and effects of doctrinal conflict during the "Nestorian" controversy (429-435). It traces the social actions of Antiochene clerics, as they fractured and reassembled their network. Officially, the Antiochenes were divided over whether to accept a settlement with Cyril's side. But these internal divisions can be seen as a competition for network leadership. When Theodoret mediated an end to these feuds, his success can be credited to a well-timed rationale for reforming his community. Chapter 5 follows the Antiochene network through a suppressed clash (435-440), a shaky truce (440-447), and a renewed controversy (447-450). It explores Theodoret's efforts, in the face of new threats, to preserve his Antiochene party. Partly his project involved personal networking, among clerics and across Roman society. Partly it involved new theological work and new narratives, both geared to foster Antiochene community. Theodoret's efforts, however, must be set against records of the Eutychean controversy, which show his network virtually collapsing. A close look at Antiochene relational patterns offers one way to explain so swift a social decline. Chapter 6 begins a broader exploration of Syrian bishops' position in late Roman society. It synchronically surveys key figures in relations of patronage, and the potential for Syrian bishops to find a place in this transactional web. Late Roman society hosted a range of would-be patrons and mediators. Local civic notables and classical educators sought favors for clients, as did courtiers, government officials, senators, bureaucrats, generals, soldiers, synagogue leaders, rabbis, theurgists, heterodox clerics, and leading monks. Theodoret's letters reveal the roles sought by one Syrian bishop in relation to potential collaborators and in contrast to rivals. Comparisons highlight his pursuit of traditional niches as well as more unusual positions. Chapter 7 turns from available roles of patronage to Theodoret's efforts to fulfill these roles. It interprets his patronage appeals as performances, tailored to encourage generosity and secure social connections. Theodoret's letters show a variety of tactics for establishing common ground, for keeping his personal distance, for directing appeals to multiple audiences, and for preserving relationships when requests failed. The letters also reveal the author's broader strategies for winning inclusion in patronage networks and for protecting himself in an acute doctrinal conflict. Chapter 8 combines the two parts of this study. It seeks the interrelations between Theodoret's performances of patronage and his teachings about Christ. In his Eranistes, Theodoret sought to justify his claim that two natures existed in Christ. Thus he asserted that Jesus needed two natures to mediate between humans and God, to secure the distribution of salvation. This argument can be seen as metaphorical reasoning, based on the author's notions of human patronage. It is not clear how many allies endorsed this specific defense of dyophysitism. But the metaphor of patronage marks one of several ways in which Antiochene doctrine might resonate with specific social behaviors. The effects, I argue, were reinforcement of doctrinal certainties and reaffirmation of partisan bonds. The book ends with a brief epilogue, surveying the legacy of this conflict during and after the Council of Chalcedon. The main conclusions of this book, however, are assembled progressively. The Christological dispute, I contend, was not just a mismatch of doctrines. Nor was it just a contest for authority. It was a crucial episode in the formation of partisan religious community. Theodoret’s People sheds new light on religious clashes of the mid-fifth century regarding the nature (or natures) of Christ. 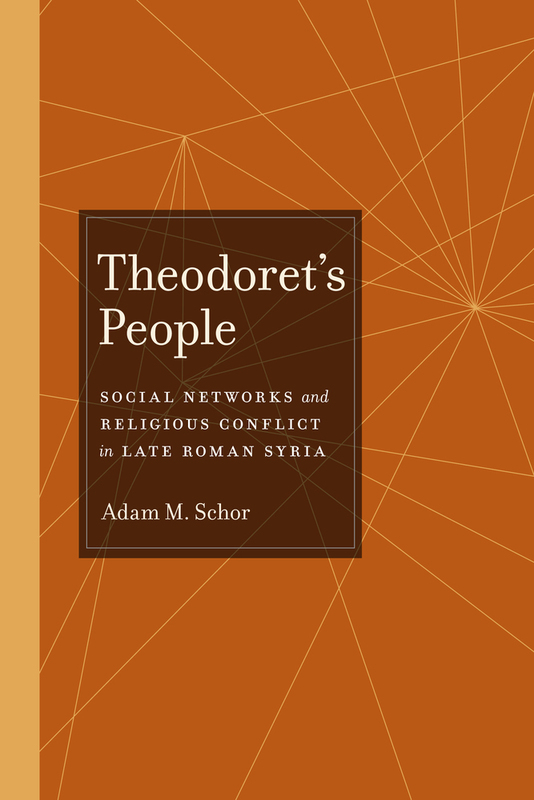 Adam M. Schor focuses on Theodoret, bishop of Cyrrhus, his Syrian allies, and his opponents, led by Alexandrian bishops Cyril and Dioscorus. Although both sets of clerics adhered to the Nicene creed, their contrasting theological statements led to hostilities, violence, and the permanent fracturing of the Christian community. Schor closely examines council transcripts, correspondence, and other records of communication. 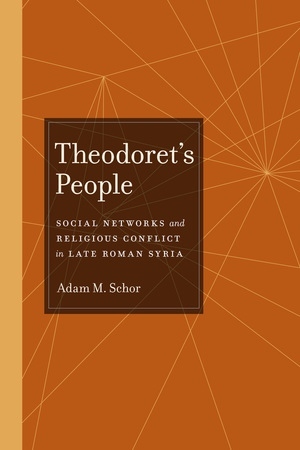 Using social network theory, he argues that Theodoret’s doctrinal coalition was actually a meaningful community, bound by symbolic words and traditions, riven with internal rivalries, and embedded in a wider world of elite friendship and patronage. Adam M. Schor is Assistant Professor of History at the University of South Carolina.